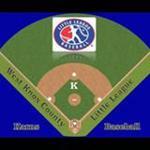 We are a volunteer run organization and the only Little League Organization left in Knox County. Our ages range from 4-12 years of age. We host a spring league which starts in March and runs till mid-June. We host a Fall league from August to October. We are located at the Karns Community Park just off of Oak Ridge Highway. At the conclusion of the season we have a All-Star season for our 7-12 year olds that go around and play in local tournaments as well as District run Tournaments.